George Walker was up in Ohio with General Motors as work in his home of Kentucky was scarce. Each weekend he would take a bus back to Kentucky in order to spend some time with his wife and young son. He’d never liked the idea of being away from his family, but work opportunities elsewhere gave him no choice. It was in the summer of 1950 that George took a bus from Hamilton, Ohio to the small town of East Bernstadt, Kentucky, to spend the weekend with his family. His home was about three miles from the main highway, and it was about two in the morning when he got off the bus at the mouth of the hollow that would lead him home. It was a warm summer, moonlit night, and George was eager to walk so he could get home to be with his wife. He was tired from the long ride from Ohio to Kentucky and needed some rest. Tree branches overshadowed the dirt road, and only the sound of a lonesome whippoorwill broke the silence of the night. George made his way down the familiar road that he had walked so many times before. The overlap of the trees made the hollow seem much darker than the cleared places that allowed more light. All George had in his pocket was a pack of Lucky Strike cigarettes, a lighter and his billfold. The cool of the night felt good on his face, and the fresh night air of Kentucky soothed him. Deeper into the hollow he traveled, not expecting any harm. All that changed in a flicker of a moment. From the right side of the road he saw a white object coming from the thick woods that stood along the side of the road. At first he thought it was a large collie dog, but as he got closer he saw, right away, it was not a wandering dog, as he had supposed. To his great surprise, it came up behind him. Something told him not to run or the white thing, whatever it was, would attack him. He knew that a large dog could kill a man if it got him down and had the upper hand – but this was certainly not a dog. Then he thought of his cigarette lighter. But first, he stopped dead in his tracks and shouted, “Get away from here,” real loud, slapping his legs trying to alarm the beast. It just stared at him, sizing him up, daring him to make a move. George snapped on his lighter, striking it as he walked along. The creature’s eyes were fixed on him, twisting its head from side to side, as if it was confused by the flame from the lighter. George kept walking, aware that the beast was trailing close to his heels. “What am I going to do to get out of this situation,” he thought. He knew that few people traveled late at night on this particular old country road, and there was a slim chance that anyone would come along in a car or a truck. Something inside him wanted to flee, but a voice in his head told him that if he did break to run, that the thing would surely attack him. It was so big, it would probably kill him with a quick slash to his throat with its sharp teeth. 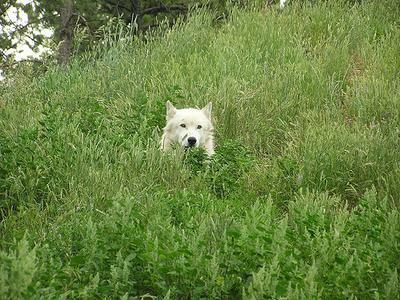 He now suspected that what was following him was a timber wolf from up North. It had probably traveled south looking for food. He knew that hunger would cause a wolf to attack a man. He had seen pictures of timber wolves, but never a live one. All he could think about was getting out of this situation, but had no idea how to do it. The wolf was far larger than the one he had seen in picture books. He kept flicking his lighter in the hope that it would keep the wolf at bay. Eventually, the fuel ran out and all George had was a flint sparking. Fear gripped him. Was it going to jump and attack him? He felt like a mouse being preyed upon by a cat. This huge beast had turned his pleasant walk home into a night of fear. George could feel the sweat dripping down his face and under his shirt, as well as his heart pounding in fear. He realized that his lighter had saved him up to that point, but wondered when the beast would get enough courage to disregard the strange flicker and perform its deadly kill. He saw an older barn standing beside the road and, as luck would have it, beside the road was a stack of tobacco sticks. If I can make it to those sticks, I will grab one and try to hit the beast as hard as I can. He will either attack me or be gone. Now that he had a plan, he walked a little faster, although the creature kept the same distance from his heels. As George arrived at the stack of sticks, quick as a flash he grabbed the first one he could get his hands on and swung his body around violently. He struck the wolf with all his power and might, breaking the stick. The wolf made a grunting sound from the hard blow and trotted off toward the woods on the right side of the road. Although George felt somewhat better, he grabbed two more tobacco sticks from the pile, just in case, and ventured on home. Scanning the woods, he looked every which way, watching for the wolf to come back at him from any angle. Walking faster, he only had about a mile to go before reaching home, determined to go down fighting for his wife and child if the wolf returned. Just ahead, the road got straighter, with a small wooden bridge beyond. As George approached, he saw the wolf standing on the wooden bridge, waiting for him. It’s going to get revenge on me, he thought. His fear returned and he could feel his heart beating loudly. Is it me, or is it the wolf? he thought. The tobacco sticks felt good in his hands. Now he had a chance to defend himself. The wolf watched as he neared the bridge, its eyes shining with the reflection of the night moon. George began swinging the tobacco stick, letting the creature know that it would get more of the same if it dared to attack. As George came to fifteen feet of where the wolf stood on the bridge, he was determined to challenge it. He watched as it jumped off the high bridge and then trotted away down the dry waterless creek bed. Soon it vanished deep within the woodland, and George was one relieved man. What a tale he would have to tell his wife when he got home. Nights in the woods of Kentucky contain many strange beasts, and noises that cannot be explained. Who knows what some walking traveler might meet on a lonesome Kentucky dirt road in the wee hours of a summer night? No doubt there are many mysteries in the backwoods of Kentucky that can never be explained.